In the nameless shanty town rambling westward of Darujhistan, an old woman squatted in front of her shack carving a stick beneath a night sky dominated by the slashing lurid green banner of the Scimitar. Her hair was a wild bush about her head tied with lengths of string, ribbon, beads, and twists of leather. Her bare feet where they poked out beneath her layered skirts were as dark as the earth the toes gripped. She droned to herself in a language no one understood. An old woman living alone in a decrepit hut was nothing unusual for the shanty town, peopled as it was by the poorest, most brokendown of the lowest class of tannery workers, sewer cleaners and garbage haulers of Darujhistan. Every second shack seemed occupied by an old widow or grandmother, the menfolk dying off early as they do everywhere – the men claiming this proves they do all the hard work, and the women knowing it’s because men aren’t tough enough to endure being old. And so this woman had lived in her squalid hut for as long as anyone could remember and none remarked upon it, except for all the surrounding old widows and grandmothers who amongst themselves knew her as ‘that crazy old woman’. Malazan fans are wide and plenty these days, so surely there’re a few people out there who will ravenously gobble up this excerpt from Ian Cameron Esslemont’s bizarrely titled Orb, Sceptre, Throne, the latest instalment in the overarching Malazan story. Me? I’m not one of them, for various reasons. 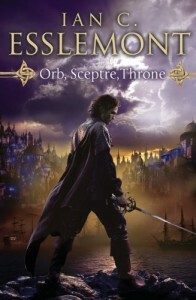 You can find the excerpt from Orb, Sceptre, Throne on Tor.com.